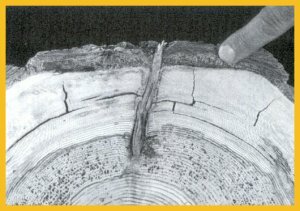 Ring rots, when they are canker rots, are major causes of defect and loss of value in Douglas fir, as shown here, and in other conifers. Canker rots: I think I know what they are. But heart rots? I don't know what they are. The fungi associated with canker rots produce wedge-like structures into the bark. The wedges then squeeze and eventually cause the death of the cambial zone. In a sense, it is as if the tree is being rewounded periodically. Heart rots are defined as the rot of the heartwood in trees. It is implied that all trees have heartwood, which is supposed to be the dead non-responsive central core wood of all trees. Further, the heartwood is thought to be darker in color than the sapwood. The subject gets increasingly more confusing as you wade through the literature, as I have done. The major problem comes when wood that has discolored following wounding is called a type of heartwood: wound heartwood, pathological heartwood, precocious heartwood. The confusion increases as you search to find a definition of heartwood. When trees that do not have heartwood are used in studies that compare heartwood with discolored wood in the same tree, then it is time to give up or try to bring some sense to all of this. It has been at least 30 years since I started writing and speaking out about this confusion in highly technical and non-technical journals and meetings. When I see new textbooks and hear some teachers, I know that very little clarification has come over the years. Science is supposed to advance as new ideas are presented and as old ideas are reconsidered and adjusted when necessary. Wood in living trees is a highly ordered arrangement of cells that are all alive when first formed by the cambial zone. In time, some cells age and die and function for transport and support. Other cells live longer and serve as storage spaces for energy reserves and spaces for bodies that carry out the essential processes of life. The fungus wedges associated with the canker rot fungus developed deep inside this oak. The wedges keep the wood open. A poor understanding of wood in living trees is a major part of the confusion. The great mass or size of trees is the next problem. To study wood, small pieces were taken into a laboratory and examined under the microscope. Wood anatomy was born; not tree anatomy! The information was valuable because products from wood were so important to economics. 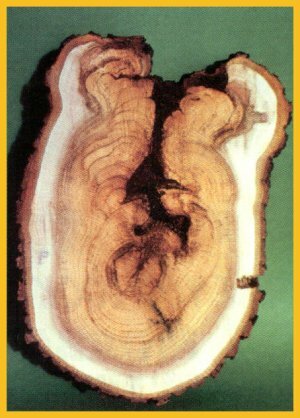 Further, because wood products were dead, and wood under the microscope was dead, soon wood was considered as a dead substance in living trees. Remember, in the laboratory the wood was fixed -killed and prepared -before being sliced for observation under the microscope. Forest products interests for economic reasons was so high because forests were thought to be endless. Products research and university studies and research on wood products were the major activities associated with trees. Tree biology never had a chance. Trees are living organisms! As living systems, trees do respond in order to survive when their survival is threatened. So simple. So extremely difficult to get accepted! Why? Because if you accept this simple fact then you must throw out mountains of data and treatments - really myths - based on trees that have dead wood. 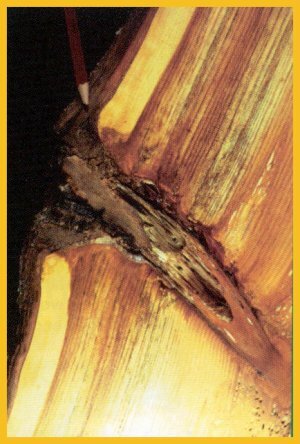 Canker rots is the subject, but to understand the subject, it is necessary to understand why there has been a problem. Canker rots have been and still are called the "true heart rots." They are called such because they appear to not fit the patterns of compartmentalization. I am very familiar with this problem. Some of my dear old research friends of years past did accept parts - but not all- of the compartmentalization theory. They still reserved the "right" to say that there are "true heart rots." The true heart rots do spread beyond boundaries, they said. And, they did, as easily seen on cross-sections of logs. Today there are still many people who believe in true heart rots. Galileo said his critics would not look through his telescope. My critics will not dissect living trees. (It's great to think that the chain saw is in the same league as the telescope!) Still. Do these "true heart rots" spread beyond boundaries? No! These rots follow the theory of compartmentalization exactly, but to recognize this you must not only dissect trees but also understand compartmentalization. Every time a living tree is wounded it will respond by first forming chemical boundaries and later anatomical boundaries, but boundaries to resist spread will begin to form as long as there are stored energy reserves. Canker rots are caused by fungi that have the genetic ability to produce wedges into bark. As the fungus wedges spread into the bark they "squeeze" the cambium zone from the outside inward. In time the cambial zone under the wedge wanes and dies. It is the same as a new wound. Then the struggle starts as the fungus "attempts" to grow into the newly declining wood tissues and the tree begins to respond in ways that resist spread. 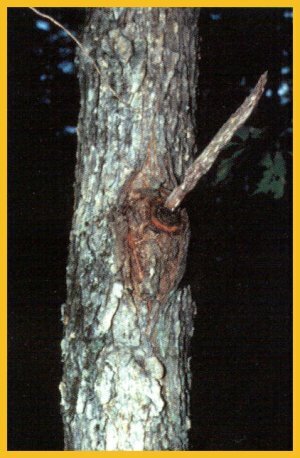 Canker rots are caused by fungi that form wedges into the bark, as shown by the pencil point in this eastern white pine. The fungi infect the resign-soaked wood and the branch corewood. On species of birch and maple (shown here), canker rot fungi produce hard masses of tissue that prevent the wounds from closing. The sexual stages of the fungi do not form until the tree dies. The heart rot concept cannot explain the patterns of decayed wood associated with canker rot fungi. 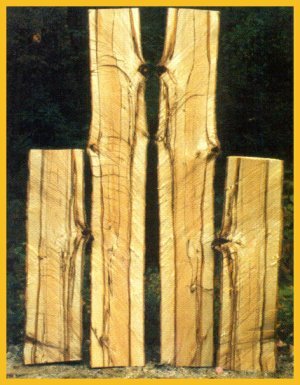 This dissection of an eastern white pine shows sound wood between columns of decayed wood. The heartrot concept is wrong and must be put to rest! One type of canker rots, called ring rots, go a few steps beyond in their attack. These rot-causing fungi grow best in wood tissues that have been altered chemically as part of the tree's defense. This is best seen in conifers and Eucalyptus species. I call this action "don't throw me in the briar patch." Remember in the Uncle Remus story where the Brer Fox caught the rabbit and wanted to be as mean as possible to the rabbit? The rabbit said to Brer Fox, do anything to me, but please don't throw me in the briar patch. The fox, thinking this was the worst thing he could do to the rabbit, quickly threw the rabbit into the briar patch. You know the rest of the story. In a sense the same actions happen here. The fungus "says" please don't form those awful defense chemicals, and the tree does. Then the fungus grows rapidly only in the wood that has the defense chemicals. No competition! The chemicals can only be formed in wood that still contains some living cells. 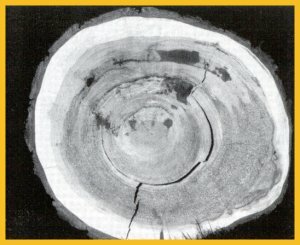 The "rings" as seen on the cross-cut surface of logs then show the rot patterns that followed the tree defense. If all of this is so, why doesn't the tree die? Simple. Time. It takes time for all of the tree response actions to take place, and it takes time for the fungus to spread. While time is going by, the tree (as a generating system) forms new cells in new spatial positions. So, we have a sort of seesaw going on as the tree responds, the fungus wedges form, the wood dies, the fungus spreads, and new tissues form. Because all these events do take time, both the fungi and the tree benefit. It is difficult for many people to understand the ways natural systems work where two "teams" are "playing" against each other, and both teams win! Trying to explain dualities goes far beyond the scope of this discussion. You either accept them or you don't! Armillaria species that incite rots of woody roots are canker rots. The fungi produce wedges into the root bark and thus keep expanding the volume of rot. As the rot spreads, tissues that would normally store energy reserves decrease in volume. A major function of woody roots is energy storage. As storage decreases because of decreasing space, a time comes when defense also begins to decrease. When defense, which requires energy, decreases, compartmentalization also begins to weaken. As compartmentalization weakens, the pathogen spreads faster. When compartmentalization no longer functions, the tree part, or the entire tree, dies. Back to old-fashioned heart rot. Again, heart rot is defined as the rot of the heartwood. Further, it was believed that all trees have heartwood, and that heartwood is dead wood, and that the heart or center of all trees is dead, and therefore back to all trees have heartwood. This is a perfect example of circle thinking that starts and finishes on premises that are thought to be correct, but really are not. First, all trees do not have heartwood. Heartwood does not have living cells, yet heartwood will discolor further or form boundaries when wounded. Next, central rots were common because trees have branches! As branches died and stubs were infected, the pathway was always to the center of the tree. Heart rots or center rots were common long before machines went into the forest! So-called saprots were rare because machine-caused wounding was rare. That has all changed in the last century, but the confusion started long before the last century. If all of this is so, and it is so simple to understand the truth, why was the truth not known long before this? Mainly because forests were thought to be endless, and that the major problems facing humans were problems of products. Trees were everywhere. Why worry about mere trees? Canker rots are common in species of poplar, as shown here. Branch stubs are the usual infection courts. 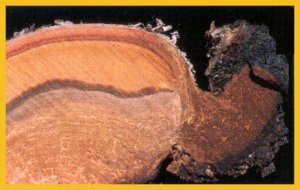 To understand canker rots, cross sections and longitudinal sections must be studied. As a young researcher, I went to wood meetings all over the world. Those meetings were all aimed at products, not living trees. It is difficult to believe that tree biology is "a new kid on the block." You will never learn about living things by studying dead things, or by calling living things by names that belong to dead things! Canker rots are all too common. 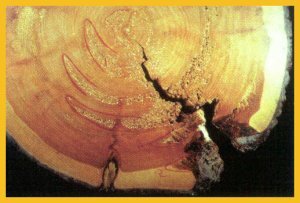 Ring rots are the most economically damaging defects in pine. Fornes pini and its variants have been called the most economically damaging fungi in the world. Of interest is the damage caused by ring rots and canker rots in Eucalyptus species. This fact is still not accepted. In 1980, I tried to publish a paper on compartmentalization in Eucalyptus species in Australia. The proposed paper was shot down in ways that made it impossible to fly again. The real problem there was not the acceptance of compartmentalization, but rather the fact that if they did, they would have to accept the cause - fire wounds. Canker rots are common in many species of eucalyptus. Note the broken branch stub and the bands of decayed wood separated by sound wood in this eucalyptus species. Note the wedge formed by the canker rot fungus in the bark of this birch. As the cambial zone is squeezed to death, the tissues beneath it are killed and invaded by the canker rot fungus. Five rings of decayed wood are in this section of an eastern white pine. The fungus infects wood formed by the tree in response to the infection. Why do arborists need to know this stuff? The quick answer is to enable them to make better decisions faster. When more tree decisions are made better and faster, everybody wins, especially the tree. Information is power. We hear it every day. We see decisions being made that affect every phase of our lives. I believe every arborist needs to know some history, some biology, and some facts about our modern marketplace. People who hire arborists to provide a service demand that the service be better, faster, and less expensive than in the past. The marketplace is the cornerstone of the business world. Enough. 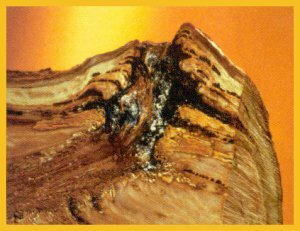 Once a canker rot is identified, the defect will only get worse. Trees do have ways to slow the process. The seesaw does go both ways. 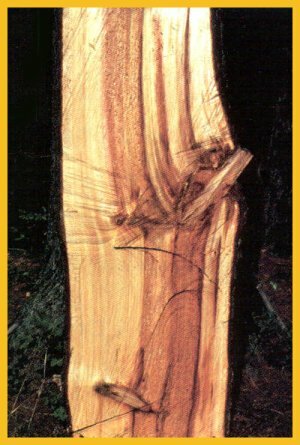 The pathogen gains some space and then the tree strengthens the newly injured area by producing not only more wood in the area of injury, but a type of wood that is much stronger than normal wood. The wood is woundwood. Woundwood is wood that forms about an injured area. The wood differs from, normal wood in that it has more lignin and the cell types and arrangements are such that they favor long-term support. That is the good news. The not-so-good news is that woundwood is very "expensive." Here we go back again to the benefits of health. And with health we go back to energy reserves. A tree that has high amounts of energy reserves will be able to form ribs of strong woundwood. A sick tree or tree under any kind of stress will not. We cannot get away from stress, health and energy. The arborist who understands this will treat all trees, including those with canker rots and other injuries, in ways that will increase health and energy reserves and decrease stress. Easy to say. Not so easy to do. Too often the decision comes to remove the tree. 4. canker rots where the organisms infect the wood first and then move to the bark. The center of this fir is sound. A ring of decayed wood surrounds the sound center wood. Note the wedges formed by the canker rot fungus in the bark to the sides of the branch stub (finger). Little is known about the early stages of establishment of the pathogens that incite canker rots. Here I give you my opinion based on research and observations. I believe the major infection court is dying, not dead, branch bases. At this point they may not be seen or recognized as stubs. I believe further that the most serious type of infection court, or individual, is one where there are still living cells but low or no defense system. (Examples with humans are easy to come by.) Next, at the crotch of branches where the trunk collar and branch collars meet, there is a gap that has been long recognized for annual plants. A similar gap occurs in woody plants. Further, for a brief time during leaf flush, the cells in the gap zone have little bark protection, even on healthy branches. When this area has stressed or dying cells, I believe this is the site and the conditions for infections that incite perennial cankers or canker rots. The major difference between the two is that with perennial cankers, the pathogens invade the bark first and later grow only slightly in the wood. With canker rots, the pathogens infect wood mostly and penetrate the bark only slightly with their wedges. I have never seen a perennial-type canker that did not have an old branch stub or branch core wood in the center. Most canker rots follow the same pattern, but I have seen a few that did obviously start at trunk wounds. Most canker rots and perennial cankers will be located between the four to 20 feet above ground level on trunks. Be on alert for them as you climb. The fungus wedges can be verified by the swollen areas about old stubs, and by exposing the wedge by cutting into the swollen area. 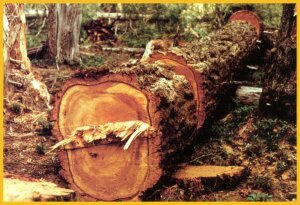 In conifers, the old branch core wood may be replaced by the wedge material. Such a wedge is often called a punk knot. On angiosperms, the swollen areas rarely produce sporophores. Sporophores may form on some standing trees after they die, but usually the fertile fruit bodies do not form until the tree is down and in contact with the ground. The same situation occurs with some perennial cankers, though not all. A longstanding forestry practice has been to remove trees with canker rots and to do so in ways that keep infected trunks above the ground. In arboriculture I am all for the use of attractive trunk sections for landscaping, but great care must be made never to use a trunk section that has canker rot. What about chipping trunks that have canker rots or perennial cankers? Can chips used for mulch support growth and fruit bodies of pathogens that incite canker rots or perennial cankers? I am not aware of research on these questions. I believe that as long as wood only is chipped there is little or no problem. However, if bark remains on some chips it is highly possible that perennial canker-causing pathogens could be disseminated. Perennial cankers commonly have fruit bodies on the bark about the canker. This section from a Douglas fir is over three feet in diameter. The center is sound. Rings of decayed wood are separated by sound wood. The heart rot concept states that heartwood is decayed after wounding. If this is so, why the sound center of heartwood? Arborists, like other professionals, are providers. They provide more than services and products that optimize the high quality time for trees. Arborists should provide information to tree owners. The information bonds the arborist with the tree owner. Information connects. Connections - isn't that what it's all about? Before I end this discussion, let me say a few words about one of my favorite subjects - myths associated with terms. The subject here is still canker rots. Let us look closely at this term. A canker is a localized lesion. A lesion is any dead spot. The lesion could completely cover an organism. Yet, when the lesion has definite limits or borders it is called a canker. Next, rot is a term indicating the breakdown process of wood. Rot is an ongoing or continuous type of process, or one that is spreading. Now, look at the two words again. One means confining or limited, and the other means continuing or spreading. So, now we have a spreading confining term. Such a term is called an oxymoron. To add more confusion to the subject, consider the term "sterile conk," given to some canker rots such as those incited by Inonotus obliquus (Poria obliqua) on species of Betula, and Poly porus glomeratus on species of Acer. A conk is a fertile fruit body. So here we have a sterile fertile fruit body. Crazy? Oxymoron? Yes. No wonder there is confusion. Reproduced with permission of Tree Care Industry and Dr. Alex L. Shigo. The article was published in Volume X11, Number 8- August 2001 of TCI. This site is dedicated to the remembrance of Robert Felix who for many years worked very hard for the improvement of the tree care industry: 1934-1996.